There are probably going to be spoilers coming up, so be warned. I’m not sure where this review is going to go. Last season’s finale upset a great many people. After teasing Glenn’s death so blatantly earlier in the season, it was pretty common knowledge that Negan killed Glenn in the comics in one of the most brutal and emotionally devastating scenes in a comic that is built on brutal and emotionally devastating scenes. So, as we built up to that final moment as Negan did his “eeny meeny miny moe” routine, we all collectively held our breaths and waiting for the punishment. We were given the worst cliffhanger maybe in television history and everybody was pissed; the critics, the fans, everyone. Even worse, for every single one of you who bitched online or to your friends, the biggest complaint was that we were cheated from knowing who Negan killed. It was a cheap ending. A cop-out. A ratings-grab. I complained, too. No doubt. We were all pissed that we didn’t get to watch and experience the pain of seeing one of our favorite characters die in brutal agony. And then to watch the other characters suffer alongside us. Because that’s who we are. The viewing audience of The Walking Dead is an amazing cross-section of society. Young people watch it. Old people watch it. Conservatives, liberals, religious people, atheists. In fact, about the only people who don’t watch it are people who gave up on it after the tedious second season, shepherded by the mostly talentless Glen Mazzara. Those people tend to check it out occasionally, watching hyped episodes (premieres, finales), only seeing the dramatic peaks and missing the journey from point to point, and then they take pleasure in telling everybody how awful the show they don’t watch is. There are the hate-watchers, too, I guess. But that’s just weird behavior that I can’t understand. Showrunner Scott M. Gimple wrote the script for this episode and Greg Nicotero directed. The Season 6 finale has been the only hiccup on their resumes when teamed-up for this show. This episode is a return to form. A brutal form that essentially did to the viewing audience what Negan did to our heroes. 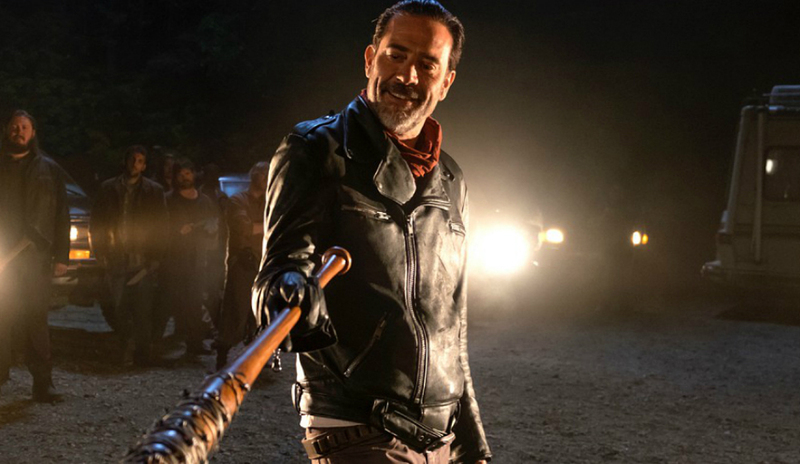 It didn’t take too long, although longer than I’d hoped, to finally reveal who Negan (Jeffrey Dean Morgan) killed in the finale. It wasn’t a terrible surprise, but it wasn’t the character everyone feared. Until it finally was. And that was what made this episode so effective. 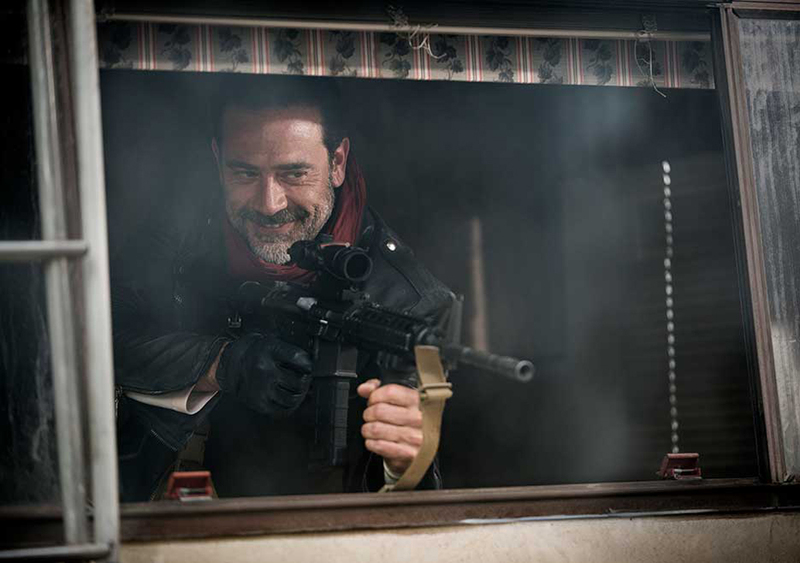 By killing Abraham (Michael Cudlitz), The Walking Dead satisfied the base expectations of everyone watching. He was in love. He’d found a purpose and meaning in his feelings for Sasha (Sonequa Martin-Green). And she’d found some sort of hope in her feelings for him. In this show, that’s the kiss of death. The odds were always pretty good that Abraham was going to die tonight. But then Daryl (Norman Reedus) did what we all wanted and punched Negan in the face. And if this were just escapist fiction or some mindless, pointless crap, that would have been it. He would have been beaten and suffered, but would later come back for revenge. Instead, Negan murdered Glenn (Steven Yeun), too. Because there are repercussions to our actions. This isn’t escapist fiction. This is tragedy. This is what life is like. And we gave them no choice. Somebody we loved had to die or it would have been meaningless. It would have been regular television. And for all those millions of people watching, thinking this was regular television, this is a gut punch. Sometimes I forget that I’m in the minority. I watch this stuff regularly. I write about it all the time. I’ve become emotionally distanced from what happens to characters in these shows and movies because most of them ultimately die horribly. But the audience for this show is kind of different. The audience for this show is the same audience that watches every iteration of Law & Order or NCIS that comes along. Where every week bad things happen, but our heroes come out on top, make a joke, and return to do it all again next week. When a character dies, it’s a heroic death. These shows help people feel like even when something horrible happens, somebody will pay for it, that justice is real. That life has meaning. But life doesn’t have meaning and justice is a social construct. Instead of that handholding, out of this tragedy and suffering, the characters persevere. They take brutal hits, grieve passionately, and become stronger. The losses can break them. They can go mad. They can do horrible things in retribution and then seek redemption. In fact, given Maggie’s character trajectory, I expect great things to come for her as the season moves on. There’s never been a mainstream television show that brutalized its audience the way The Walking Dead has. This is tough love at its most basic. And it does what it does, it killed who it killed tonight, because we demand to be brutalized. 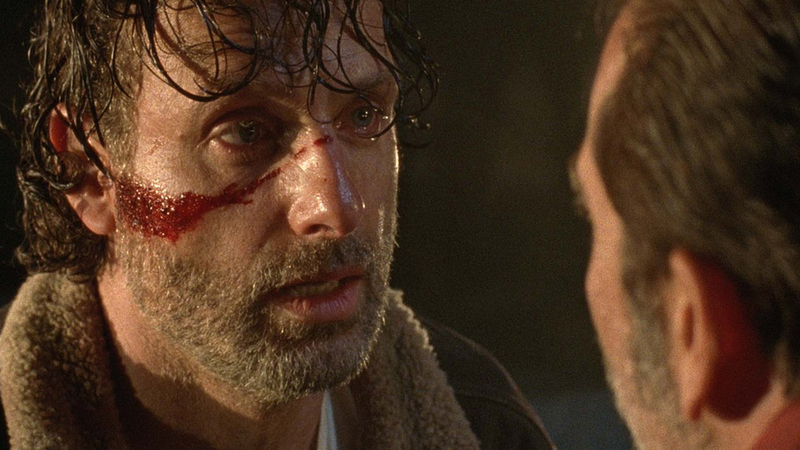 “The Day Will Come When You Won’t Be” is about making it clear to Rick (Andrew Lincoln) that he had crossed a line last season. That he is not untouchable. He went from a character in the beginning who, wracked with guilt for giving in to passion, went back into a zombie-filled city to save the white supremacist he’d handcuffed to a roof. He let the Governor escape a trap because killing him like that wouldn’t have been the right thing to do. He finally slipped loose of the old-world morality, puffed himself up, and did horrible things in the name of keeping his family safe, all the time thinking he would be able to out-tough anyone who came along. Thinking that was what it was going to take to survive in the apocalypse. Turns out he was wrong. You have to be willing to do horrible things, but volunteering to do them in anticipation of a potential threat makes you the villain. And it also has devastating repercussions when you run into a real villain.